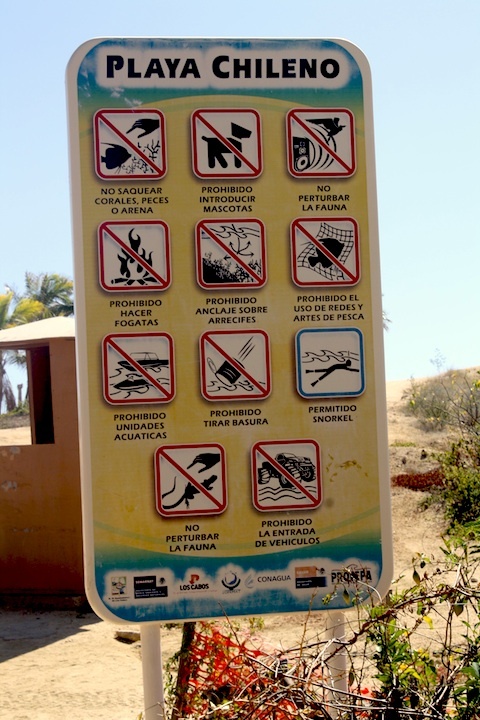 It’s a long running joke (or a perhaps misconception) among Cabo visitors that you cannot swim at any of Cabo’s beaches. While it’s true that many of the beaches are dangerous for swimming, there are more beaches that just Medano Beach that you can swim at. I took this picture on a visit to Chileno Beach in the Corridor. It’s actually a very nice beach complete with restrooms and other facilities. You’ll find families picnicking, children snorkeling and lots of people laying out in the sun. The irony in this picture is how many things were prohibited (disturbing the wildlife, littering, boats, etc) but snorkeling was definitely allowed!! Where’s your favorite beach to swim or snorkel at in Cabo?